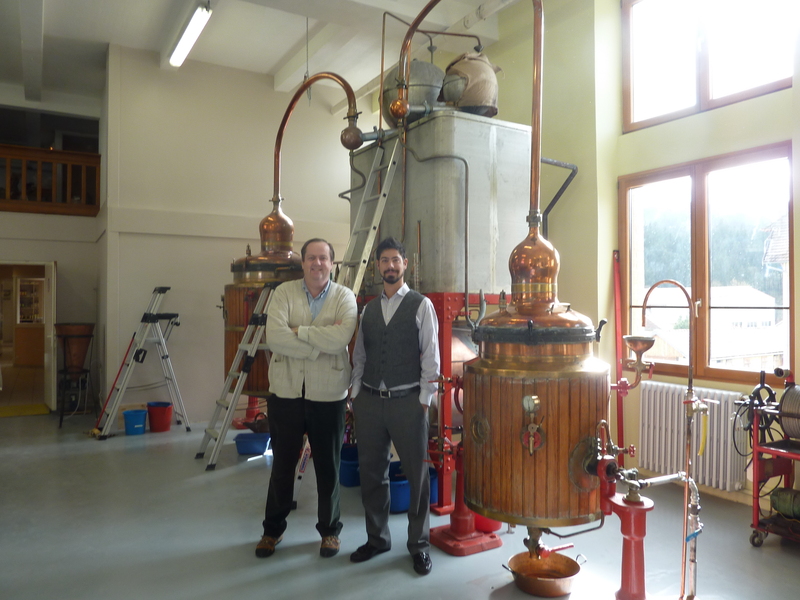 Graham Wasilition, right, with David Nathan Maister in front of one of the stills at Distillerie les Fils d' Emile Pernot in Pontarlier, France, where Tenneyson absinthe is distilled and bottled. I first met Graham Wasilition during the SXSW conference in Austin last March thanks to an introduction by the Lush Life Productions crew. During an Austin spirits event, Graham let myself and another blogger, Emily Cavalier, try a sample of his then-unreleased new absinthe, Tenneyson Absinthe Royale. I was immediately fond of the product, especially since it was the first absinthe I’ve tried that included a hint of juniper. I also appreciated the mildness of the anise flavor compared to many other absinthes. Emily and I were also impressed that Graham, at 27 years old, was creating his own brand. Earlier this week, Tenneyson appeared on store shelves at Imperial Wines (First Avenue at 88th Street) on NYC’s Upper East Side. I caught up with Graham online to learn more about the launch. Q: When did you decide to get in the business of creating absinthe? A: After I graduated from Virginia Tech in Materials Science Engineering, I went to Austin to work for an international semi-conductor manufacturer and had eye-opening experiences in global travel, as well as food and drink. This was right around the time when absinthe resurged globally. My commitment to absinthe came when I got in touch with consultant/expert David Nathan-Maister (the author of The Absinthe Encyclopedia and a world-renowned absinthe and ancient spirit historian). There were so many products rushing to the market with false promises, information, and inferior quality. We saw an opportunity to bring together the best available resources and create a product that people could respond to and be excited about. Little did I know how long it would take us, along with Master Distiller Dominique Rousselet, to create a truly unique and high-quality brand that we could consistently deliver. Q: How did you find the distillery in France? How did you create the recipe? A: After developing a plan with David Nathan-Maister, he became a partner in the Emile Pernot Distillery in Pontarlier, France. This was such an incredible break because this distillery is one of two historic and active distilleries able to produce absinthe in the famed “Absinthe Town” of Pontarlier, France, former home of the most infamous brand in absinthe history, Pernod Fils. It also gave us unprecedented access to some of the highest quality herbs and aromatics available anywhere, and the most authentic to true absinthe history. We wanted to utilize French skills and century-old copper alembics to create a Swiss style juice because it is lesser known than the traditional French style and a little less polarizing. It also is traditionally lower in alcohol and therefore more widely approachable. We went through many, many iterations of the recipe and ended up using a take on a traditional Swiss recipe with a hint of juniper berry and orange peel which gives Tenneyson a New Western twist. We are very happy with the subtle and authentic profile which we finally settled on. Q: Why the name Tenneyson? A: After the creation of the formula, we wanted to try and convey the idea of the brand through the name. The twist of using some slight gin technique by including a little juniper berry and orange peel led us to try and come up with a UK-inspired name that played to the history of our absinthe. The UK poet Alfred Lord Tennyson was a famed absinthe drinker and I came across the spelling TENNEYSON in a British baby name book. I thought the name related closely to the history of absinthe and played on the UK inspiration. I have since found some information that Tenneyson is also a derivative of Dionysus, the Greek God of Wine, which also seems quite fitting. We get comments about what a great name we have and I completely agree and am excited that we were lucky enough that no one was already using it. Q: Is NYC the first city to sell Tenneyson? What is the price point? Which other cities will see it this year? A: NYC is the first city in the world where Tenneyson is available. There is a lot of competition there, but that allows for the quality brands and good values to come out on top. We are working on the availability as we speak and want to be able to provide Tenneyson to as wide of a group as possible. However, we do not want to over-extend ourselves. We want to move into markets that will appreciate Tenneyson and be able to sustain consistent business. We make Tenneyson in small batches and need to manage the introduction with this in mind. It is currently retailing in NYC for around $50 and we will soon be offering it in the hot and up-and-coming markets in Texas. I’m sure we will see it in many more of the major markets across the country this year and even online very soon. Q: What is your favorite way to drink Tenneyson? A: This is kind of a loaded question because the easy answer would be off the coast on a boat with friends and family. When we are talking specific cocktails, I like to drink Tenneyson a few ways. The traditional absinthe drip (sans sugar) works great and is perfectly balanced because the Pontarlier Wormwood is historically a little sweeter than wormwood sourced elsewhere, so I think it is sweet enough. I also think a simple prep is to drink Tenneyson with tonic water. Tonic water is basically the 21st century sugar water and the slight gin notes of Tenneyson Absinthe make an interesting profile. The beautiful louche is also a conversation starter and you can garnish it with an orange to bring a different color. We also do a cocktail with Orangina that tastes kind of like a twist between a mimosa and a screwdriver that is perfect for brunch. You can check our website for a few other cocktails. Many people think that absinthe needs to be prepared only one specific way, but there is no reason that it cannot be enjoyed as flexibly as any other great spirit. Q: As far as you know, are you one of the youngest founders of a spirit brand? A: I’m not sure that I am one of the youngest founders of a spirit brand. I have been working on this since my early 20’s, but it is my experience that a lot of innovation and energy comes from the younger generation. I’d also say that my naivete as a young entrepreneur with a head packed with illusions of grandeur actually helped me to keep moving forward when people were negative or professed that things would never work out. As an example, I was told that the name Tenneyson would not be available to trademark, but I followed up and did my research and proved that notion wrong. My age doesn’t normally come into play, but it is kind of fun being able to do “business” until last call and still be able to get up and at ’em early the next day with a clear head and strong conviction. Q: What hurdles have you had to overcome to import your absinthe? A: Well, there are too many to list here. I think that anyone starting a business of any kind will come across roadblock after roadblock, but you have to deal with each one as they come. We have dealt with things from raising money, writing contracts, distillation consistency, sourcing ingredients, securing distribution, shipping logistics, government compliance, currency exchange rates, to things like self-doubt and convincing people that we aren’t crazy. Trying to stay on budget and schedule seem to be the overwhelming pressures while being true to the craft of distillation and the history of absinthe. When in doubt the latter is our priority! A: To get a good nights sleep! But seriously, I love the industry and the category so I’m in no rush to go anywhere. I would love to grow the brand of Tenneyson and expose consumers (specifically in the U.S.) to the actual history of absinthe and enlighten as many as possible, whether they are drinking my brand or a comparable competitor. It’s fun being in the business and I’m looking forward to future opportunities with respect to Tenneyson and/or anything else that comes along. I’m not very good at being bored and I love having fun and pushing the limits! 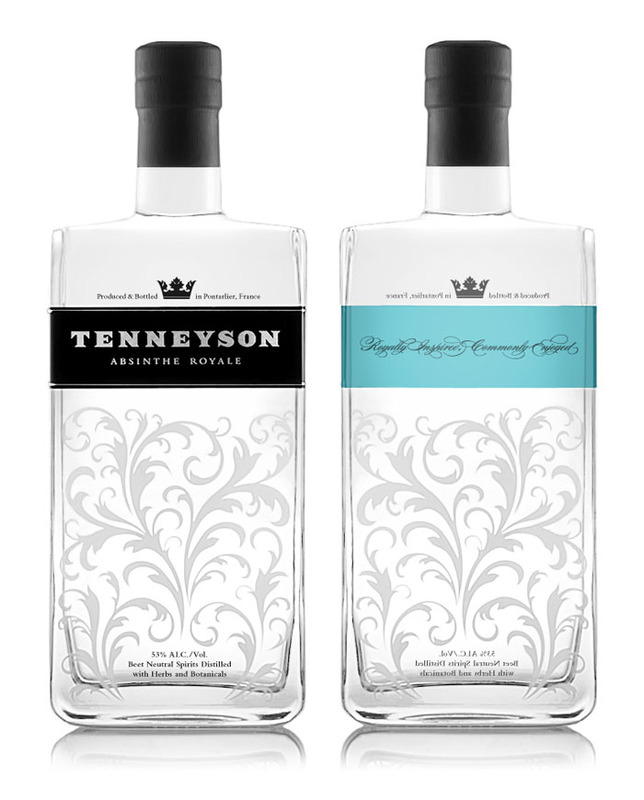 Tenneyson Absinthe Royale (retails around $50) hit store shelves in NYC this week. 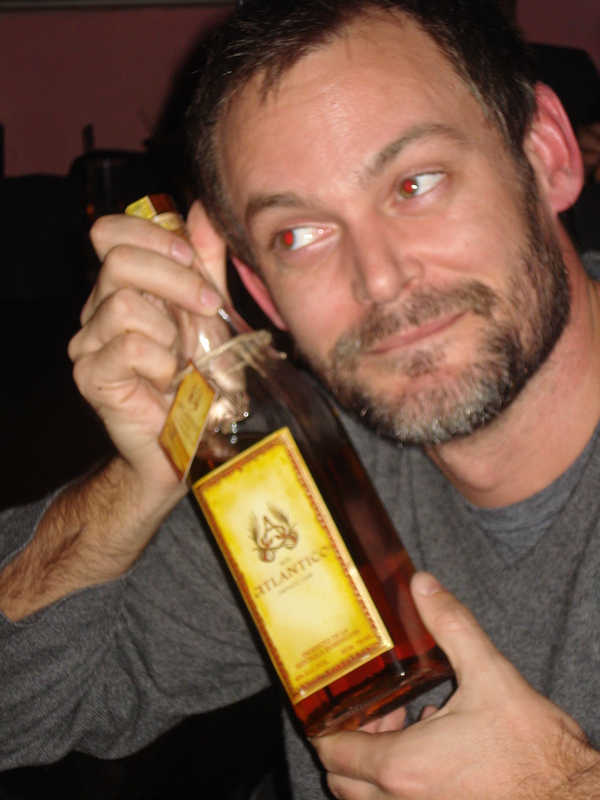 Brandon Lieb loves Atlantico Rum. Given the recent opening of the city’s first rum-centric bar, Roneria Caracas in Williamsburg, rum may very well be the next premium spirit to win over NYC’s cocktail crowd. 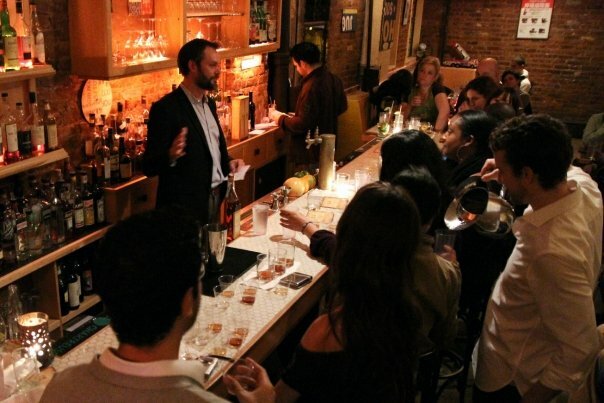 So it was good timing that Brandon Lieb, the Miami-based co-founder of Ron Atlantico, recently made an extended visit here to share his sipping rum and get to know the NYC cocktail scene. Brandon, who formerly worked for Bacardi, founded Atlantico with Aleco Azqueta, whose family owns the Casa de Campo resort in the Dominican Republic. There, they found a third-generation master blender to produce Atlantico from small-batch, aged rums that are blended and then aged in bourbon casks. Composed of rums between 15 and 25 years old, the additional aging process uses the solera method (typically used for sherry), which allows the flavors to mellow and marry. 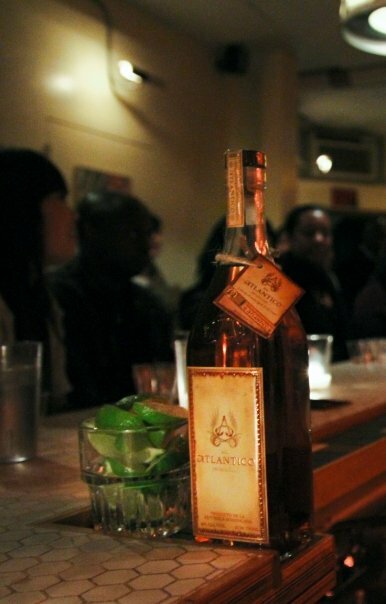 A true dark rum, Atlantico has gentle vanilla and toffee flavors without the overpowering sweetness of a spiced rum. It’s lusciously complex with a smooth finish, and is best sipped neat, on the rocks, or mixed in a daiquiri. When he first arrived in New York a few months ago, Brandon introduced Atlantico to the Dominican neighborhoods in the Bronx and Washington Heights before hitting Manhattan hotspots such as Rose Bar, Le Cirque, and Philippe. He said the Latin communities of New York and Miami have embraced Atlantico, preferring to sip it neat, although in Miami the daiquiri is approaching the cult status of the mojito. Today, Brandon is headed back to Miami, just in time to skip the winter chill in NYC. Meanwhile, he’ll be watching from afar to see how Atlantico and other sipping rums fare during the dark spirits season here, where rye, scotch, and bourbon are popular methods for keeping warm. He hopes imbibers will notice Atlantico’s cigar-inspired label as bars increase their stock of premium rums. “We’re not trying to be the biggest rum, but we’re trying to be one that people appreciate,” said Brandon. Atlantico Rum. Photo by Lush Life Productions. Brandon leading a tasting at Louis 649. Photo by Lush Life Productions. Gardner Dunn of Suntory Whisky loves his job. You probably recognize the above quote from the 2003 film Lost in Translation starring Bill Murray and Scarlett Johansson. Around that time, Suntory was still best known for its melon liqueur, Midori, but over the past few years, its single malt whisky, Yamazaki, has infiltrated U.S. shores and quietly stolen the hearts of many a scotch drinker. Yamazaki 12 year and 18 year, both prize-winning in blind tastings, are made at Japan’s oldest distillery, founded by Scotland-educated Shinjiro Torii in 1923. Created with the level of craftsmanship the Japanese are known for, the whisky is aged in Japanese, American, and Spanish oak casks, lending a full-bodied flavor and silky smooth finish. Over the past year, many of NYC’s best-known cocktail bars have featured drinks made with Yamazaki, such as the “Gold Rush” at Goldbar and the “Murray Sour” at Minetta Tavern. This is mainly due to the work of Gardner Dunn, North American Brand Ambassador for Suntory Whisky. Gardner recently got an advanced course on all things Yamazaki when he traveled to the Suntory distillery on the outskirts of Kyoto, a location chosen for its water source. The Vale of Yamazaki, hailed by famous master of the tea ceremony, Senno Rikyu, is legendary for its pure water. Inspired by the art of Japanese bartening, which includes techniques such as ice ball carving and the hard shake, Gardner set out to gather Japanese bartending tools to show to the many skilled bartenders he’s met stateside. He’s put together a “Godzilla Kit,” with tools including crystal mixing glasses with a lip, bar spoons with forks on the opposite end, and Japanese jiggers, which have a thinner and deeper design and more balanced weight than standard jiggers. Suntory's "Godzilla Kit." Photo by Leo Borovskiy of Lush Life Productions. Yamazaki 12, Hibiki 12, and Yamazaki 18. Stephen Yorsz loves his job. Maker’s Mark, that trusty Kentucky bourbon, has not changed one damn bit since the Samuels family reinvented their recipe in 1953. Red winter wheat in the mash, as opposed to rye, gives the bourbon a smooth balance, and the brand is known for producing small batches aged in charred oak barrels for five to seven years, producing a subtly sweet caramel flavor. It’s also considered a whisky (instead of a “whiskey”) due to the brand’s Scottish heritage. When it comes to using bourbon in cocktails, some mixologists prefer more super-premium, small-batch bourbons, or rye whiskey, which has come back in style, while Maker’s Mark’s is one of the top-selling whiskys (behind Jack Daniels and Jim Beam). NYC Maker’s Mark Distillery Diplomat Stephen Yorsz says crafty cocktailians who roll their eyes at Maker’s are missing out. “Don’t confuse commercial success with lack of quality,” he said. Given Stephen’s background as a bartender for hotspots such as Home, Guesthouse, and STK, it’s not surprising that he wants to bring Maker’s into trendier enclaves like Simyone Lounge (formerly Lotus). While Stephen credits the cocktail renaissance with encouraging more people to break out of their vodka comfort zone and try brown spirits, he doesn’t see why bourbon can’t move from places like Employees Only into the nightlife scene as well, where Grey Goose and Patron still rule. At the same time, he takes pride in the brand’s history as a no-nonsense spirit.